QPR: Green, Hall, Onuoha (c), Phillips, Chery, Austin, Faurlin, Henry, Luongo, Perch, Konchesky. SUBS: Hill, Gladwin, Lumley, Emmanuel-Thomas, Doughty, Hoilett, Polter. WOLVES: Martinez; Iorfa, Stearman (c), Hause, Golbourne; Henry (van La Parra 63), McDonald, Coady, Edwards; Afobe, Dicko (Le Fondre 45). SUBS: Ikeme, Doherty, Ebanks-Landell, Price, Ojo, van La Parra, Le Fondre. KJ will be gone by xmas. He has had 3 months to replace Sako and his solution is Edwards. No chance of promotion. a good team begins with a solid defense. We need Danny back and Hause going out on loan somewhere. Anybody still want to discuss Bake off? Funny that we always give a team without a win a helping hand. Austin did not even feature in their first game. 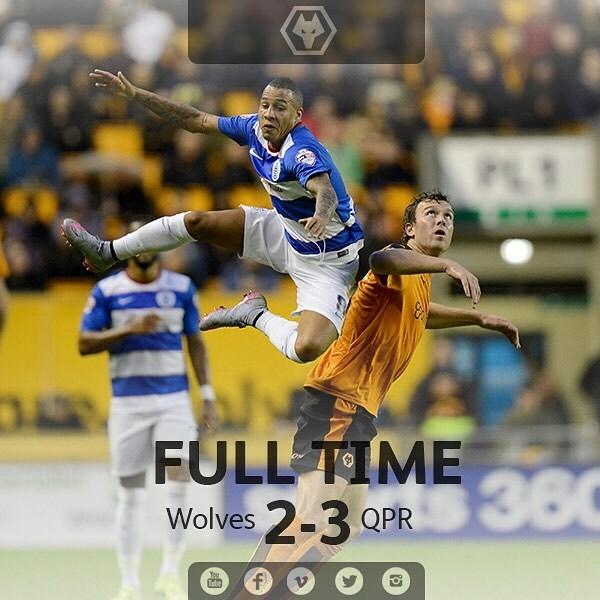 Very disappointing result ... but give QPR credit for getting back into the game and for taking it away. Onwards and upwards, no big deal in the grand scheme of things. thanks for blog folks- shame about result- take care all of you ! Geez, what a bunch of optimists here! Still 129 pts to play for! well bye all of you. sorry we lost but glad you are all out there to share The wolves with me here in Texas. "Sad Face" I'm off to bed!